Fiona Bryde Colquhoun was born on July 20 1918, the daughter of Clan Chief Sir Iain Colquhoun, 7th Baronet of Luss, First World War hero and Lord Lieutenant of Dunbartonshire, and his wife Dinah Tennant. Brought up at the Colquhoun family home at Rossdhu, now the Loch Lomond Golf Club, she was educated by a governess, and swam every day in the loch before breakfast in summer and winter. She came to love the Loch Lomond islands, particularly Inchconnachan — one of four the family owned. 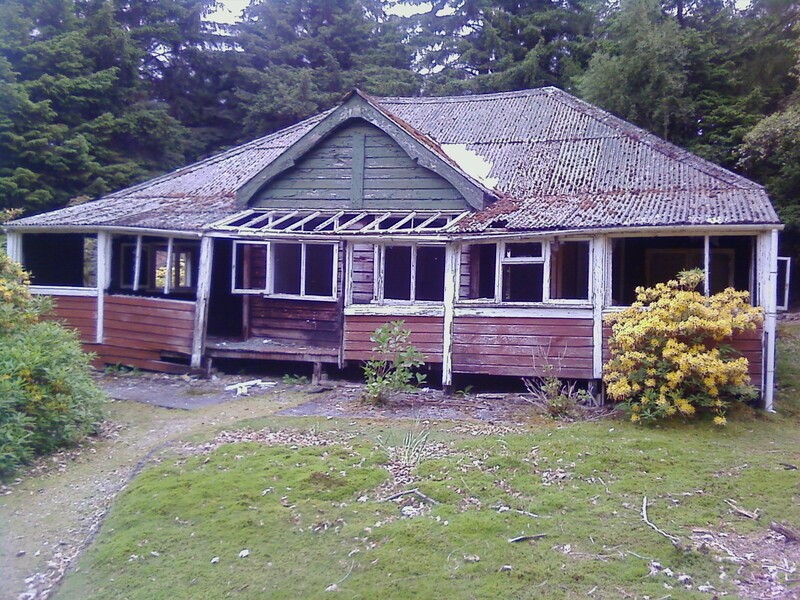 Sister of the late Sir Ivar Colquhoun and aunt of the present Clan Chief Sir Malcolm, she used for many years as a holiday home a bungalow built on the island in the 1920s by a retired Colonel who was a friend of Sir Iain. She first rented it from Luss Estates in the 1960s and continued to use it until the mid-90s. It still stands today, but has deteriorated markedly since 2009. Sir Malcolm has obtained planning permission to replace it, and hopes to do so soon. Lady Arran, whose pet badgers lived under the verandah, introduced wallabies to the island shortly after the end of the Second World War. They flourished there until recent years until there were culls by Luss Estates. Sir Malcolm said: “These completely alien animals caused utter devastation on Inchconnachan — and were almost certainly the cause of the disappearance of the capercaillie. “The wallabies, which are thought at one stage to have numbered well over 120, systematically stripped the island of all its low vegetation, its place being taken by an impenetrable moss, in places up to three feet thick, that prevents any regeneration whatsoever. Inchconnachan, Gaelic for ‘The Colquhoun's Island’, was one of a few places in Scotland where the magnificent capercaillie, the rare turkey-like giant grouse of the high tree tops, could be seen, probably attracted by the many beautiful Scots pine, Douglas firs and Larch. Inchconnachan was also known to be a favourite hideaway for the men of Luss to make illicit whisky hidden, avoiding the prying eyes of the revenue men. 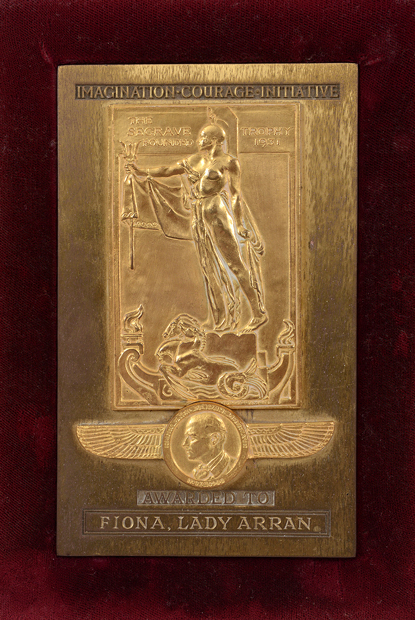 Described by Harold Macmillan, later to be Prime Minister, as the prettiest girl he had ever seen, Fiona married Eton and Oxford-educated Sir Arthur Kattendyke Strange David Archibald Gore, known to his friends as “Boofy”, in 1937 at the age of 19. They made their home at Pimlico, near Hemel Hempstead in Hertfordshire, where Fiona kept an ever-growing menagerie. It included wallabies, pot-bellied pigs, llamas and alpacas, caged birds, horses, a fox and several dogs, and it is said that the family wore Wellington boots in the house to fend off ankle-biting badgers. Lady Arran always called her current favourite badger Rosie, which she would take with her to the smartest houses in England. “Nobody but Fiona would have carried this off,” a friend said. Just before the Second World War was declared in 1939, Lady Arran was in a supercharged Mercedes car when it clocked up 100mph on Oxford Street in central London. She exclaimed on emerging from the car: "That was rather fun." During the war she was a driver with the Wrens and worked for the Ministry of Information, as did her Press Attache and journalist husband. In 1958 he succeeded his brother to become the 8th Earl of Arran, and she became the Countess of Arran. An active member of the House of Lords, “Boofy” (left) was a passionate advocate of homosexual rights and introduced a Sexual Offences Bill three times. He also campaigned for the protection of badgers, and eventually helped to pilot the Badger Protection Bill through both Houses of Parliament. They even had a badger motif attached to the radiator of their chauffeur-driven Rover provided by the Daily Mail, of which Lord Arran was a director, and she had a monohulled boat named Badger I. 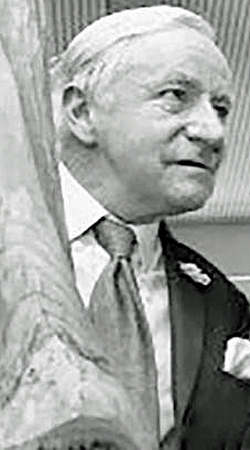 The Earl, a brilliant speaker, became best known in the 1960s for his weekly column in the London Evening News — in which he was sometimes billed as “The Earl You Love To Hate”. This ran until 1978, when he suffered a stroke, a misfortune he blamed on his daily intake of a half-bottle of champagne before lunch. 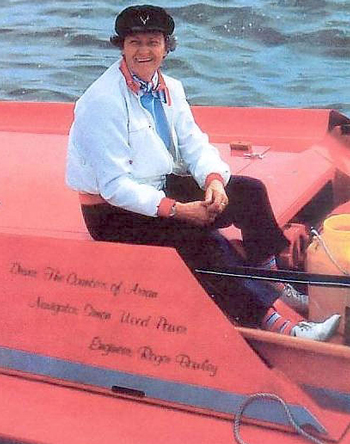 That first thrill in the powerboat in Kaye Don’s Miss England III, a hydroplane powered by Rolls-Royce aero-engines, inspired what was to be Lady Arran’s lifelong love of speed — although it was not shared by the Earl. She said of him: “He was a superb shot and a very eccentric writer. As wife to such a man I had a difficult role to play, so I took up power boat racing to give me something for myself. “He was always very cross when I went out racing and used to phone the club to see where I'd got to. They never knew where I was." In 1965, after watching the Paris Six Hours circuit marathon on the Seine from the yacht of a British naval architect, Commander Peter du Cane, she bet a friend that the following year she would be one of the starters. True to her word, she was the sole woman competitor and finished 14th out of 90 in Badger I. Bored by circuit racing, Lady Arran — whose hero was Donald Campbell — soon progressed to offshore racing. In Badger II, a 20ft Don Shead design, the unlikely champion powerboater set a new speed record of 55mph for Class III offshore powerboats. For the 1970 season she was at the helm of Badger III, a Cougar catamaran. She turned to a young naval architect, Lorne Campbell, who designed a series of three-point hydroplanes in which Lady Arran competed in offshore races. Having broken the Class I record on Lake Windermere in 1971, she won the Class D championship in 1976 in the 26ft powerboat Skean-Dhu. Lorne Campbell next came up with Cael-na-Mara, a 30ft reverse three-pointer with three Mercury outboard engines on the back. But the craft’s performance disappointed, and Lady Arran reverted to Skean-Dhu. In 1979, she set a new Class II world record of 93mph. On August 11 the following year she piloted the vessel, with its twin 225hp Mercury outboards, to 102.45mph on Lake Windermere — an achievement that earned her the highest accolade in powerboating, the Segrave Trophy. She continued to win competitions, eventually completing the Round Britain offshore race, a demanding event even for the fit young men who made up the other contestants. Asked why she did it, she said simply: “For Scotland”. Called the fastest granny on water, she said: "Speed relaxes me — it's in my blood; always was and always will be." 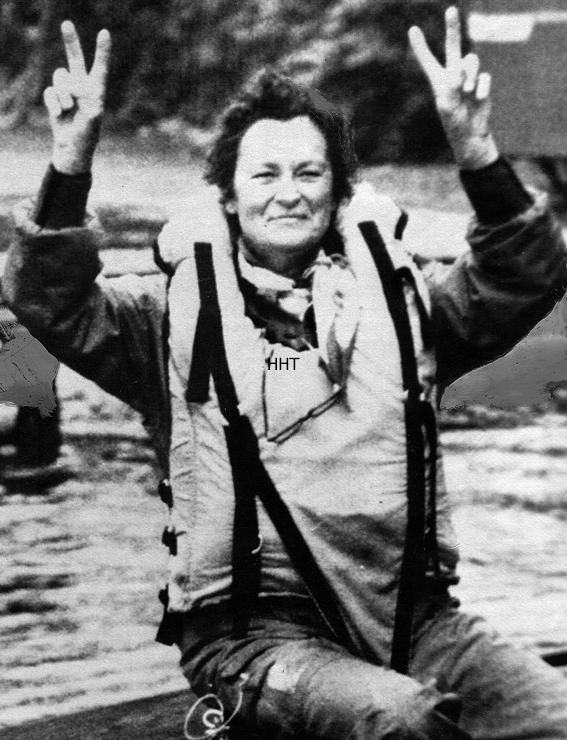 In the 1980s she took to dry land and horse-driving. Prince Philip was said to be amazed by his latest hell-for-leather competitor, and Lady Arran was described as driving like Boadicea. She made a late comeback on water, helping to design and construct a revolutionary electrically-propelled 15ft hydroplane, An Stradag (The Spark). On November 22 1989, six years after the death of her husband, she piloted the tiny craft to another record, achieving a silent and environmentally-friendly 50.825mph. She was then 71. Lady Arran was also a painter. Her pictures were rich in atmosphere and feeling, and were exhibited at galleries in St James’s, London. Both she and her husband were imaginative supporters of good causes. One example was in August 1971 when they took a party of children whose parents worked at the Clydebank division of Upper Clyde Shipbuilders, together with some parents and shop stewards, on a boat trip on Loch Lomond, with Lady Arran taking the wheel of one of the boats. She always wore some item of clothing in the Colquhoun tartan, often a tartan cap set at a jaunty angle. This lifelong staunch advocate of the beauty of Loch Lomond and personal friend of 007 creator Ian Fleming died in Devon on May 16 2013 at the age of 94, survived by the elder of her two sons, the Devon-based 9th Earl of Arran. The funeral was at Filleigh in Devon on May 24, and she was buried in Luss.